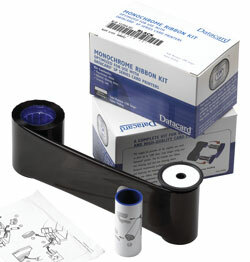 Genuine Datacard 532000-052 K HQ 500-print monochrome ribbon kit. Datacard recommends using authentic Datacard supplies to ensure the best performance from your ID card printer. Datacard 532000-052 K HQ ribbons are ideal for printing economical, high-quality (HQ) cards using one-color text, barcodes and/or line art, and feature an Earth-friendly biodegradable core. K HQ 500-print monochrome ribbons consist of a high-quality black resin K panel. The Datacard 532000-052 replaces the Datacard 552954-604 ribbon.